The INS was founded in Paris after the first International Congress on Epidural Spinal Cord Stimulation in Groningen, the Netherlands, in 1989, by a select group of physicians: Dr. Augustinsson, a Swedish neurosurgeon; Dr. Galley, a French cardiologist; Dr. Illis, a British neurologist; Dr. Kranick, a German neurosurgeon: Dr. Meglio, an Italian Neurosurgeon; Dr. Sier, a Dutch vascular surgeon and Dr. Staal, a Dutch neurosurgeon. Bridging the gap between neurologists, neurosurgeons, vascular surgeons and cardiologists seemed unlikely in existing scientific societies. That need spurred the creation of the INS, a multidisciplinary and international society. The initial life of the INS was not an easy one, since it constituted a radical departure from the traditional time-honoured mainstream European scientific societies. 1992: The First Scientific Meeting of the INS was held in Rome. Although it was scientifically excellent, it had some organisational difficulties. The meeting, however, sensitised a portion of the European medical community to the concept of neuromodulation as an emerging multidisciplinary field. 1994: The Second extremely successful Scientific Meeting of the Society was held in Gothenburg, Sweden. The Board was replaced and Giancarlo Barolat was nominated President. 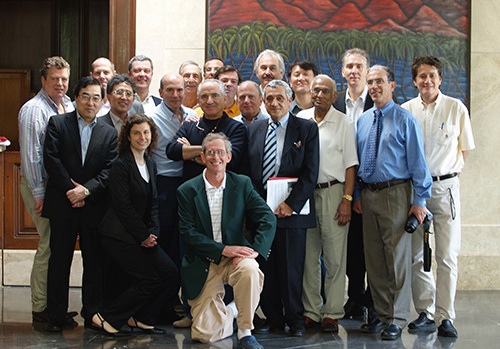 The newly created Board was constituted by Michael DeJongste, a cardiologist from the Netherlands; Claus Naumann, an anaesthesiologist from Switzerland; Luc Claeys, a vascular surgeon from Germany; Wolfhard Winkelmüller, a German neurosurgeon; Jan Holsheimer, a scientist from the Netherlands; and Giancarlo Barolat, a neurosurgeon from Philadelphia, USA. Other Board Members subsequently were added throughout the next six years. 1995: The American Neuromodulation Society, the first chapter of the INS, was created. This inspired tremendous interest, particularly among the anaesthesiology community in the USA. The Society has grown extensively under the leadership of its former Presidents, Ballard Wright, Michael Stanton-Hicks, John Oakley and Samuel Hassenbusch. 1996: The Third Meeting of the INS was held in Orlando, Florida, USA. The meeting was a success and drew attendees extensively from the US and Europe. The meeting definitely validated, both for the medical community and for Industry, the existence of neuromodulation as a discipline. 1998: Thanks to the efforts of Elliot Krames, an INS Board Member, the INS' Journal, Neuromodulation, was first published in January of 1998. The Journal, published by Blackwell Science, is the official publication of the INS. The journal contains articles of the highest scientific calibre. The Fourth International Meeting of the INS was held in Lucerne, Switzerland in conjunction with the International Functional Electrical Stimulation Society Meeting. 1999: A formal affiliation was formed with the International Functional Electrical Stimulation Society (IFESS). This was a very important step since it brought into the INS a group of very innovative scientists with major scientific and technical contributions. A section of the journal, Neuromodulation, was exclusively dedicated to articles on functional electrical stimulation ad its numerous (and growing) applications. 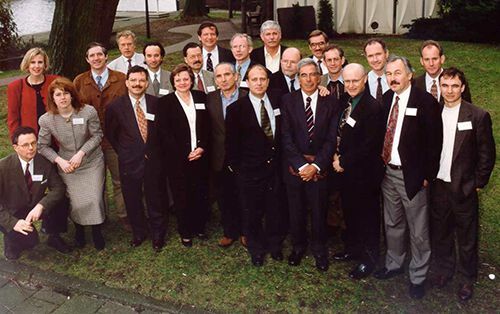 The Italian Neuromodulation Society was founded in 1999, under the presidency of Mario Meglio. 2000: The meeting of the INS was part of the Worldwide Pain Conference held in San Francisco, California, USA. During the meeting, Brian Simpson, a distinguished neurosurgeon from Cardiff, Wales, United Kingdom, took over the presidency of the INS. Under his guidance, the Society has continued to grow and gain further momentum. The other officers of the Board were: Michael DeJongste, Secretary; Robert Foreman, Treasurer; Elliot Krames, Editor-in -Chief of Neuromodulation; Giancarlo Barolat, Immediate Past-President. 2001: The Neuromodulation Society of the United Kingdom and Ireland was created under the presidency of Simon Thomson and held its first scientific meeting at Basildon. The Italian Neuromodulation Society held its first scientific meeting in Florence, Italy. Sherri Kae Calkins left the position of INS Executive Director after seven years of dedicated service. The INS moved its Executive Office to San Francisco and appointed a new Executive Director, Tia Sofatzis. 2002: The INS established its web site. The Benelux Chapter of the INS, uniting Belgium, The Netherlands and Luxembourg, was initiated under the presidency of Liong Liem. 2003: 23 – 25 May: The 7th Annual Meeting of the North American Neuromodulation Society took place in conjunction with Johns Hopkins University 9th Annual Multidisciplinary Pain Medicine Update, in Orlando, Florida. June 25 – 28: The 6th INS Congress took place in Madrid, Spain, in conjunction with the Sixth Meeting of the Spanish Pain Society (SED), hosted by Dr. Enrique Reig. During this meeting, Professor Mario Meglio, a distinguished neurosurgeon from Rome, Italy, assumed the Presidency of the INS, and Simon Thomson, President of the INS United Kingdom and Ireland Chapter, took over as Secretary. Dr. William Raffaeli, formerly the Technical Scientific Secretary, became the President of the Italian Neuromodulation Society. The other officers of the Board are: Robert Foreman, Treasurer; Elliot Krames, Editor-in-Chief of Neuromodulation; Brian Simpson, Immediate Past-President. 10-12 October: The Neuromodulation Society of the United Kingdom and Ireland hosted its 3rd Scientific Meeting at St. Thomas Hospital in London. 21 –22 November: The Benelux Neuromodulation Society held its First Scientific Meeting in Leuven, Belgium. 2004: 9 March: The Australian Neuromodulation Society was formed under the leadership of Dr. Marc Russo in Canberra, Australia. 28 April – May 1: The North American Neuromodulation Society hosted its 10th Annual Meeting. Dr. Joshua Prager was elected President-Elect of the Society. 27 – 29 May: The Italian Neuromodulation Society held its Annual Congress in conjunction with the 26th National Congress of the Italian Chapter of the IASP in Vasto, Italy. 5 September: During the INS Board of Directors Meeting in Bournemouth, England, Dr. Ross Davis who is the International Functional Electrical Stimulation Society’s (IFESS) Liaison to the INS Board, invited an INS Board Member to participate on the IFESS Board as INS Liaison. The INS Board elected Mr. Brian Simpson to serve as the INS’ representative, and as liaison with Dr. Davis between the two Societies, in perpetuity. 7 September: The INS hosted a special session on Neuromodulation during the IFESS Annual Congress in Bournemouth, England. 12 – 13 November: The Neuromodulation Society of the United Kingdom and Ireland held its 4th Annual Meeting in Liverpool England, during which Mr. Paul Eldridge was Elected President to succeed Dr. Simon Thomson. Dr. Thomson assumed the role of Immediate Past President. 20 November: The German Neuromodulation Society held its formation meeting and elected officers in Frankfurt, Germany. 9 December: The Southeastern European Neuromodulation Society’s first general assembly took place in Athens, Greece. May 1: During the INS’ first Director-at-Large Election, the INS General Membership voted for and elected Dr. Bengt Linderoth from the Karolinska Hospital in Stockholm, Sweden, and Dr. Giancarlo Barolat of Denver, Colorado, USA, both of whom are pioneers in the field of neuromodulation, as the INS’ new Directors-at-Large. 10 – 13 June: The 7th INS Congress was held in Rome, Italy, in conjunction with the Italian Neuromodulation Society’s annual meeting, immediately preceding the World Society of Stereotactic and Functional Neurosurgery Meeting. Professor Mario Meglio organized and hosted all three educational conferences. Dr. Elliot Krames, a pain and neuromodulation specialist from San Francisco, California, USA, and the Editor-in-Chief of Neuromodulation, was inducted as President-Elect of the Society, during the General Assembly of Members on 12th June. Likewise. Dr. Bengt Linderoth and Dr. Giancarlo Barolat were inducted into their roles as Directors-at-Large on the INS Board of Directors. 9 July: The INS hosted a special session on neuromodulation in the International Functional Electrical Stimulation Society’s Annual Congress in Montreal, Quebec, Canada. 2006: 9 April: First Scientific Meeting of the Australian Neuromodulation Society was held in Melbourne, Australia, as a Satellite Symposium to the Australian Pain Society’s Annual Meeting. 10 June: Dr. Elliot Krames took office as the new President of the INS during the Board of Directors meeting in Lille, France. 12-15 September : The INS hosted a special session on neuromodulation at the 11th Annual International Functional Electrical Stimulation Society Conference, which was held in Miyagi-Zao, Japan. 19-21 October: The 6th Annual Scientific Meeting of the Neuromodulation Society of United Kingdom and Ireland (NSUKI) took place in Cork, Ireland, in conjunction with the Irish Pain Society’s Meeting. 19-21 October: The South East European Neuromodulation Society Roundtable was held in Hania-Crete, Greece. October: The new, interactive INS website was launched. 18-19 November: The 4th Annual Meeting of the Benelux Neuromodulation Society was held in Maastricht, The Netherlands, during which Prof. Bart Nuttin was elected as the new BNS President, and Prof. Veere Visser-Vandewalle as the new Vice President. 7-9 December: The 10th Annual Meeting of the North American Neuromodulation Society (NANS) was held in Las Vegas, Nevada. Back row, left to right: Simon J Thomson, MBBS, FRCA, FIPP; Jon Valentine, MB, ChB, FRCA MRCP(UK) - president of the NSUKI chapter; Eduardo Barreto, MD of the Brazilian chapter in formation; Ross Davis, MD, INS director-at-large; Athanasios Koulousakis, MD, - president of the DGNM chapter; Brian Simpson, MD, FRCS; Jung Kyo Lee, MD - of the Korean chapter in formation; Bart Nuttin, MD, PhD - president of the Benelux chapter; Liong Liem, MD. Row in front of back row, left to right: Takamitsu Yamamoto, MD, PhD - Japan representative; Luan Guoming, MD, PhD - of the Chinese Neuromodulation Society in formation; Damianos Sakas, MD - president of the SE Europe chapter; (behind man in black shirt) Francisco Robaina, MD, PhD - president of the Spanish chapter; Giancarlo Barolat, MD - director-at-large; Krishna Kumar, MD - president of the Canadian chapter in formation; Joshua Prager, MD, MS - president of NANS. Row in front of kneeling person, left to right: Tia Sofatzis - executive director; Mario Meglio, MD, PhD; Paolo Poli - president of the Italian chapter. In front: Elliot S. Krames, MD, DABPM. 2007: 26 March: The Spanish Neuromodulation Society (SENEMO) became an official chapter of the INS. 1 April: The 3rd National Congress of the Italian Neuromodulation Society took place in Rimini, Italy, during which Dr. Paolo Poli was elected as the new President of the chapter. 1 April: The 2nd Scientific meeting of the Australian Neuromodulation Society was held in North Terrace, Adelaide. 4-6 May: The First Annual Meeting of the Canadian Neuromodulation Society was held in Niagara-on-the-Lake, Ontario, during which the membership voted in favor of joining the INS as a national chapter society. Prof. Krishna Kumar would serve as the Society’s first President. 26 May: The 21st Annual Congress of the Japan Neuromodulation Society took place in Tokyo, Japan. 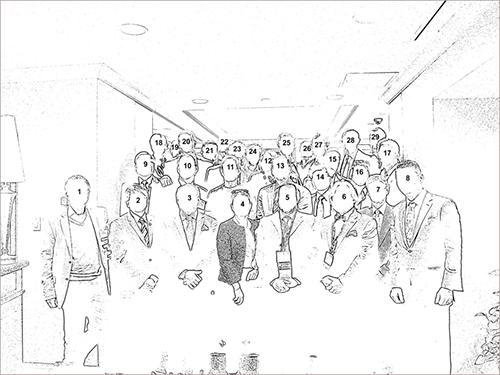 The International Neuromodulation Society full board met in June 2015 in Montreal. A numbered key to the list of people pictured in the 2015 full board photo. SEE a video interview about the early days and history of the INS: "Giants of Neuromodulation and INS Genesis (2017)"